The song, named after the American singer Barbra Streisand, extensively uses a sample from German disco group Boney M.'s 1979 international hit single "Gotta Go Home", which in turn borrows content from the 1973 German song "Hallo Bimmelbahn" by the band Nighttrain (the brothers Heinz and Jürgen Huth and Michael Holm; the hookline was written only by Heinz Huth). The sample of "Gotta Go Home" was replayed by Mark Summers at SCORCCiO Sample Replays. The single’s album artwork is modelled directly after Streisand's own 1980 album, Guilty, which features a picture of her and Barry Gibb on the sleeve. For the "Barbra Streisand" cover, Streisand and Gibb's faces are digitally removed and replaced with duck beaks. The music video is set in New York City and it features many prominent and affiliated artists making cameo appearances, such as Kanye West, Pharrell Williams, André 3000, Ryan Leslie, Buckshot, Smif-n-Wessun, DJ Premier, Todd Terry, Chromeo, DJ Mehdi, So Me (who also directed the video), Diplo, Questlove, Ezra Koenig, Santigold, Yelawolf, The Roots & Fafi and the Fat Jew of Team Facelift. Nick Levine of Digital Spy gave the song five out of five stars stating, "... 'Barbra Streisand' actually kinda suits the track, a sassy, no-messin' disco-house dazzler which tips its trilby in the direction of Studio 54 circa 1979 – happily enough, just when Babs was enjoying her own dancefloor dalliance with 'The Main Event' / 'Fight' and 'No More Tears'. Lack of lyrics notwithstanding, it's deliriously catchy, endlessly danceable and ultimately so uplifting that it could even cheer you up after watching the denouement of 'The Way We Were'." Jason Lipshutz from Billboard gave the song a positive review describing it as "one of the weirdest, most intoxicating dance anthems in recent memory," and wrote: "The most surprising thing about this collaboration ... is its richness in sound in between the beat-stopping utterances of Streisand's name. Guitar licks collide with heavy doses of synthesizers as a fist-pumping beat refuses to let up. The busy instrumentation is brilliantly paired with overly simple vocals: An upbeat chorus of 'oohs' instantly lodges inside the listener's brain, and 'Barbra Streisand' morphs into an inexplicable command to start dancing." Michael Cragg of The Guardian called the song "an insanely catchy slice of disco house." The song peaked at number eighty nine on the Billboard Hot 100, and number one in the Billboard Hot Dance Club Songs chart on the week ending on December 18, 2010. In the United Kingdom, the song debuted and peaked at number three on the UK Singles Chart on October 17, 2010 ― for the week ending date October 23, 2010 ― selling 67,000 copies in its first week. It also topped the UK Dance Chart. In the Netherlands, the song debuted at number twenty five on the Dutch Top 40. It rose up to number 2, staying there for several weeks. It broke the record for the most time spent in the second position, without ever reaching the first place. The song was featured in the Glee second season episode entitled "Born This Way". This song was used as the goal song for the Calgary Flames for their 2011-2012 season. This song was used heavily for the Philippines' Department of Tourism ad campaigns in 2012-13. This song was featured in a commercial for Vitaminwater in 2011. ↑ Fitzmaurice, Larry. "Video: Duck Sauce: "Barbra Streisand"". Pitchfork Media Inc. Retrieved 25 March 2011. ↑ Levine, Nick. 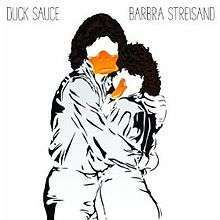 "Duck Sauce: 'Barbra Streisand'". Digital Spy. ↑ Lipshutz, Jason (5 November 2010). "Duck Sauce, "Barbra Streisand"". Billboard. Archived from the original on 21 November 2010. Retrieved 20 November 2010. ↑ Cragg, Michael (29 September 2010). "New music: Duck Sauce – Barbra Streisand | Music". The Guardian. UK. Retrieved 21 November 2010. ↑ Mason, Kerri (24 October 2010). "Duck Sauce Use Famous Friends to Score Dance Hit | Billboard.com". Billboard. Archived from the original on 21 November 2010. Retrieved 20 November 2010. ↑ Futterman, Erica (27 April 2011). "'Glee' Recap: Everyone's Proud to be 'Born This Way'". Rolling Stone. Wenner Media. Retrieved 29 April 2011. ↑ "Vitaminwater Revive Commercial". Retrieved 9 October 2014. 1 2 "Barbra Streisand". Amazon.co.uk. 1 2 "Barbra Streisand – Download". iTunes. 1 2 "Barbra Streisand: Duck Sauce: Amazon.de: Musik". Amazon.de. 1 2 "Amazon.com: Barbra Streisand: Duck Sauce: MP3 Downloads". Amazon.com. 1 2 "Barbra Streisand – Single by Duck Sauce – Download Barbra Streisand – Single on iTunes". iTunes Store. Retrieved 20 November 2010. ↑ "Barbra Streisand – Single – Download". Spinnin' Records. Archived from the original on 20 October 2010. ↑ "Australian-charts.com – Duck Sauce – Barbra Streisand". ARIA Top 50 Singles. ↑ "Austriancharts.at – Duck Sauce – Barbra Streisand" (in German). Ö3 Austria Top 40. ↑ "Ultratop.be – Duck Sauce – Barbra Streisand" (in Dutch). Ultratop 50. ↑ "Ultratop.be – Duck Sauce – Barbra Streisand" (in French). Ultratop 50. ↑ "Duck Sauce – Chart history" Canadian Hot 100 for Duck Sauce. ↑ "ČNS IFPI" (in Czech). Hitparáda – Radio Top 100 Oficiální. IFPI Czech Republic. Note: insert 20102 into search. ↑ "Danishcharts.com – Duck Sauce – Barbra Streisand". Tracklisten. ↑ "Duck Sauce: Barbra Streisand" (in Finnish). Musiikkituottajat – IFPI Finland. ↑ "Lescharts.com – Duck Sauce – Barbra Streisand" (in French). Les classement single. ↑ "Musicline.de – Duck Sauce Single-Chartverfolgung" (in German). Media Control Charts. PhonoNet GmbH. ↑ "Chart Track: Week 41, 2010". Irish Singles Chart. ↑ "Duck Sauce – Barbra Streisand Media Forest". Israeli Airplay Chart. Media Forest. ↑ "Italiancharts.com – Duck Sauce – Barbra Streisand". Top Digital Download. ↑ "EHR top 40". Retrieved 22 August 2012. ↑ "Luxembourg Digital Songs - November 27, 2010". Billboard. ↑ "Nederlandse Top 40 – Duck Sauce search results" (in Dutch) Dutch Top 40. ↑ "Charts.org.nz – Duck Sauce – Barbra Streisand". Top 40 Singles. ↑ "Norwegiancharts.com – Duck Sauce – Barbra Streisand". VG-lista. ↑ "Listy bestsellerów, wyróżnienia :: Związek Producentów Audio-Video". Polish Airplay Top 100. Retrieved 5 December 2011. ↑ "Dance Chart :: Listy bestsellerów, wyróżnienia :: Związek Producentów Audio-Video" (in Polish). ZPAV. 16 January 2011. Archived from the original on 13 May 2012. Retrieved 14 October 2011. ↑ "Archive Chart: 23 October 2010". Scottish Singles Top 40. ↑ "SNS IFPI" (in Slovak). Hitparáda – Radio Top 100 Oficiálna. IFPI Czech Republic. Note: insert 20111 into search. ↑ "Spanishcharts.com – Duck Sauce – Barbra Streisand" Canciones Top 50. ↑ "Promusicae (Week: January 1, 2011)" (PDF). Retrieved July 13, 2011. ↑ "Swedishcharts.com – Duck Sauce – Barbra Streisand". Singles Top 100. ↑ "Swisscharts.com – Duck Sauce – Barbra Streisand". Swiss Singles Chart. ↑ "October 2010/ Archive Chart: 23 October 2010" UK Dance Chart. ↑ "Archive Chart: 2010-10-23" UK Singles Chart. ↑ "Billboard Hot 100: Week of May 14, 2011 (Biggest Jump)". Billboard. Retrieved 6 May 2011. ↑ "Duck Sauce – Chart history" Billboard Hot Dance Club Songs for Duck Sauce. ↑ "ARIA Charts – End Of Year Charts – Top 100 Singles 2010". Australian Recording Industry Association. Archived from the original on 5 December 2010. Retrieved 8 January 2011. ↑ "dutchcharts.nl – Dutch charts portal". dutchcharts.nl (in Dutch). Hung Medien / hitparade.ch. Archived from the original on 22 November 2010. Retrieved 3 January 2011. ↑ "European Hot 100". Billboard. 31 December 2010. Retrieved 16 August 2011. ↑ "Archived copy". Archived from the original on 10 January 2011. Retrieved 7 February 2011. ↑ "FIMI – Federazione Industria Musicale Italiana – Ricerche e dati di mercato". Fimi.it. 17 January 2011. Archived from the original on 22 July 2011. Retrieved 16 August 2011. ↑ "Archived copy". Archived from the original on 4 January 2012. Retrieved 3 January 2013. ↑ "Archived copy". Archived from the original on 9 January 2012. Retrieved 15 August 2014. ↑ ""Loca People" – Hit of the Year 2011 in Poland!". ZPAV. Dj Promotion. 2011. Retrieved 7 January 2012. ↑ "Archived copy" (PDF). Archived from the original (PDF) on 18 April 2013. Retrieved 26 August 2012. ↑ "Archived copy". Archived from the original on 15 August 2013. Retrieved 2 January 2012. ↑ "Canadian single certifications – Duck Sauce – Barbra Streisand". Music Canada. ↑ "Certificeringer - Duck Sauce - Barbra Streisand" (in Danish). IFPI Denmark. Retrieved May 20, 2013. 1 2 "Duck Sauce" (in Finnish). Musiikkituottajat – IFPI Finland. ↑ "Gold-/Platin-Datenbank (Duck Sauce; 'Barbra Streisand')" (in German). Bundesverband Musikindustrie. ↑ "New Zealand single certifications – Duck Sauce – Barbra Streisand". Recorded Music NZ. ↑ "Top 50 Canciones Anual 2011" (PDF) (in Spanish). PROMUSICAE. Retrieved February 5, 2012. ↑ "Duck Sauce - Barbra Streisand" (in Swedish). Grammofon Leverantörernas Förening. Retrieved March 5, 2012. ↑ "Certificeringer - Duck Sauce - Barbra Streisand" (in Danish). IFPI Denmark. Retrieved October 20, 2013. ↑ "Barbra Streisand – Single by Duck Sauce – Download Barbra Streisand – Single on iTunes". iTunes Store. Archived from the original on 15 November 2010. Retrieved 21 November 2010. ↑ "Barbra Streisand – Single by Duck Sauce – Download Barbra Streisand – Single on iTunes". iTunes Store. Retrieved 21 November 2010.